In precarious mountain terrains like the Himalayas, road cut slopes are highly vulnerable to slope failures. Slope failures in the region are often triggered by natural factors such as neotectonism, rainfall, seismicity, weathering, erosion, etc. However, rapid human intervention is an additional factor causing large-scale slope instability in the region. Unplanned excavations of slopes for construction and/or widening of roads decrease slope stability. The inevitable slope failures cause major inconvenience to tourists and residents and are also responsible for severe injuries and loss of lives and property. The present study incorporates a stability analysis of road cut slopes along National Highway 58 (NH-58) from Kaliyasaur to Rudraprayag, Uttarakhand. Vulnerable slopes were identified during the field survey. To evaluate stability conditions of rock mass, rock mass classification systems including rock mass rating (RMR), continuous slope mass rating and the Geological Strength Index (GSI) were employed to identify different stability grades. Furthermore, quantified GSI was correlated with basic RMR in a bivariate plot, which showed a linear relationship. Kinematic analysis was also carried out to identify the probability of structurally controlled failures due to adversely oriented discontinuities. Outcomes from different methods corroborated each other and matched the existing site conditions. Landslides are significant hazards that can be disastrous to property and often claim a death toll. As per the National Disaster Management Authority , 15% (approximately 0.49 million km2) of the area including the Himalayas, the Arakan-Yoma belt in the northeastern region, the western Ghats and Nilgiri Hills is marked as a critical region for landslides in India. In the Uttarakhand Himalayas, road and highway networks act as arteries and a lifeline for various socio-economic developmental activities. Lacking a railway network and airfields, the region depends exclusively on roads for communication and transportation. In these precarious terrains, roads are constructed along the hills by excavating slopes. Often excavation for road construction and widening projects is done using faulty geoengineering techniques because of insufficient consideration of certain geological and geotechnical factors that cause slope instability . To address the persistent threat of landslides, Mondal et al. recommended performing fractional and controlled blasting during excavation. The stability of natural or engineered slopes is governed by many factors including the lithology, structural discontinuities, degree of weathering, relief, rainfall, seismicity, anthropogenic activities, etc. [21, 24, 32, 37, 47, 48, 56, 59]. The interplay of discontinuities in rocks and other geological and geotechnical parameters is a primary causes of slope failures [15, 18, 20, 27, 34, 49, 57, 58]. The prevailing structural conditions and the nature of the slope-forming material also play significant roles in slope failure . Roads in the Himalayan terrain often experience large-scale devastation due to landslides. Many sections, particularly those manifesting major discontinuities, are threatened by landslides. Slope stability analysis along roadways constitutes an important aspect of studies assessing landslide vulnerability. Vulnerability analysis of engineered slopes is of paramount importance for landslide hazard assessment . Despite major improvements and breakthroughs in the recognition, prediction and mitigation of slope failures, landslides still exact a significant social, economic and environmental toll in the hilly terrains. The major pitfalls are inadequate understanding of the underlying mechanism of slope failure and the interplay of causative factors of slope failures. 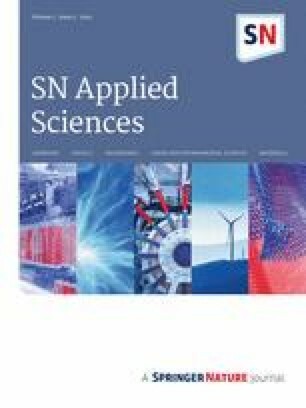 However, recently, ample pioneering work has been done by many researchers employing conventional and numerical simulation approaches, and a much better understanding of rock slope engineering practices has been achieved [13, 14, 18, 20, 22, 23, 38, 50, 51, 55, 61]. In different sections of the Uttarakhand Himalayas, noteworthy studies on slope stability have been carried out by various researchers and organizations, which have provided reasonable and rational insights into environmental fragility, particularly in areas traversed by major and minor tectonic structures [18, 20, 52, 54, 60, 67, 69]. Although much work has been done, certain sections within the Himalayan terrain still need to be explored and undergo proper geotechnical assessment. According to the National Institute of Disaster Management (NIDM), a significant portion of Uttarakhand state is highly prone to landslides. The National Disaster Management Authority (NDMA) prepared a landslide hazard zonation map of Uttarakhand, designating the study area as highly vulnerable. Uttarakhand state is well known for severe natural hazards such as landslides, floods, cloudbursts, seismicity, etc. These hazards are interlinked; the occurrence of one may trigger or increase the intensity of another, and the impacts of such events are disastrous. Recently, the state had such a disastrous event in Kedarnath and the nearby areas. On 16 and 17 June 2013, Uttarakhand experienced the fury of nature; the area witnessed flash floods and large-scale landslides. This is considered the nation's worst natural disaster since the tsunami of 2004. Kedarnath valley of Uttarakhand and the adjoining areas received exceptionally heavy rainfall, about 375% more than the benchmark rainfall. The area also experienced extensive cloudbursts, which caused melting of Chorabari Glacier upstream of Kedarnath. Consequently, the Mandakini River experienced heavy floods near Gaurikund, Ukhimath, Agastmuni and Rudraprayag in Uttarakhand state. The village of Rambara, close to Kedarnath, was completely washed away because of the massive flow of debris; many hotels and shops were swept away, leaving no signs of civilization . Rao et al. reported that post-disaster satellite imagery showed that the river banks along the Kedarnath valley had been completely eroded. According to statistics provided by the Uttarakhand Government on 16 July 2013, more than 5700 people were presumed dead. Destruction of bridges and roads caused severe injuries and a significant death toll. Rautela  compiled the sequence of events occurring during the Kedarnath tragedy and summarized the aftermath issues, also reporting that approximately 4094 persons were lost just in Mandakini Valley. Several other researchers and organizations reported on the damage caused, triggering factors, terrain response and rescue programmes during the disaster, and some also proposed reconstruction solutions to recover from such disasters [11, 65, 68]. Flash floods during the disaster triggered many large- and small-scale landslides in the region and weakened the stability of slopes in the long term. Many road cut slopes were washed out completely and several sections were significantly affected. The NH-58, which connects Delhi to Badrinath, also experienced deterioration of the cut slopes. This route is important as the road experiences heavy vehicular traffic year round, which increases exponentially during summer because of extensive tourism and the pilgrimage season. The road cut slopes in the region need to be assessed for the probability of failure and accordingly implementation of remedial measures is a prerequisite to attaining better safety and economics along the highway. During the preliminary and feasibility stages of the project, rock mass classification methods provide a reasonable overview of stability . 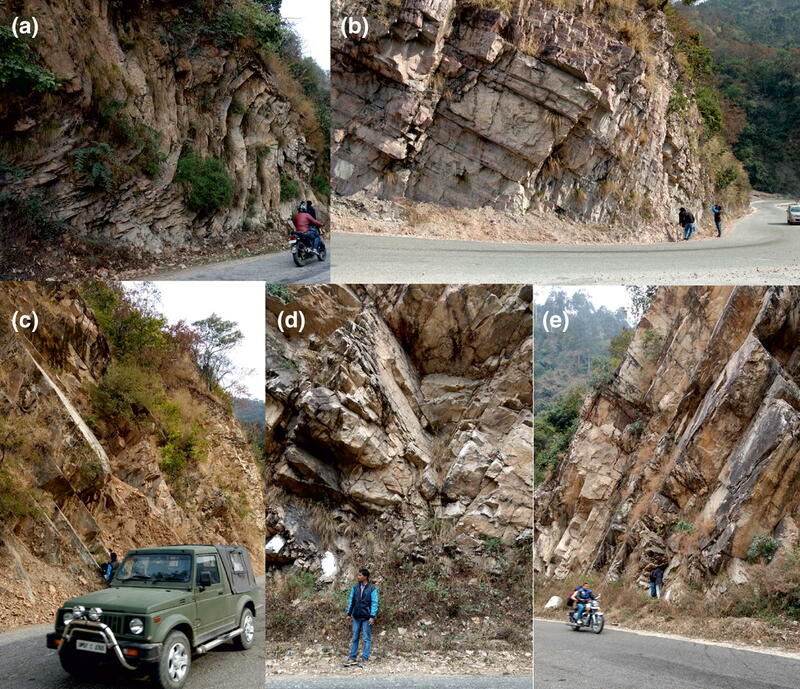 The present study attempted to characterize vulnerable road cut slopes along NH-58 from Kaliyasaur to Rudraprayag by using a rock mass classification tool. Moreover, structurally controlled failures were identified by employing kinematic analysis. Accordingly, remedial measures are suggested to improve the stability grade of slopes for safer and faster economic growth in the region. The study area lies in the Rudraprayag district, which covers an area of about 24392 km and lies between latitude 30° 19′ 00″ and 30° 49′ N and longitude 78° 49′ and 79° 21′ 13″ E. It falls under Toposheet nos. 53 J and 53 N. The area can be approached from Rishikesh and Dehradun via a motorable metalled road. However, railway links are not available in the district. The average annual rainfall within is about 1485 mm. The investigated road cut slopes lie along NH-58 from Kaliyasaur to Rudraprayag in Alaknanda valley. This route plays an important role in transportation and communication up to the remote areas of the terrain. Geologically, the study area lies at the northeastern flank of the Garhwal Syncline. The studied locations from S1 to S7 were marked in satellite imagery (Fig. 1). The study area mainly comprises the Rautgara Formation of the Damtha Group of the outer Lesser Himalayas, which is well exposed along road cut sections from Srinagar to Rudraprayag. According to Kumar and Agrawal , the Rautgara Formation is best developed in the Alaknanda valley. where RMRBasic is evaluated according to Bieniawski . F1, F2 and F3 are adjustment factors related to the orientation of discontinuities with respect to the slope, and F4 is the correction factor for the method of excavation. Furthermore, Tomás et al. proposed continuous functions for calculating the adjustment factors (F1, F2 and F3) as illustrated below. The CSMR is widely recommended over the SMR because the continuous functions in the CSMR reduce the ambiguity that arises because of the border value and provide a better approximation of the stability grade. where A = ǀαj − αsǀ for planar failure; A = ǀαj − αs − 180°ǀ for toppling failure; A = ǀαi − αsǀ for wedge failure. where B = βj for planar failure; B = βi for wedge failure; F2 remains 1 for toppling mode of failure. where C = βj − βs for planar failure; C = βj − βs for toppling failure. where C = βi − βs for wedge failure. αs is the dip direction of the slope facet, αj is the dip direction of the joint, βs is the dip amount of the slope facet, βj is the dip amount of the joint, αi is the dip direction of the line formed by the intersection of two joints and βi is the amount of plunge of the line formed by the intersection of two joints. The adjustment factor for the method of excavation (i4) was fixed empirically as follows: The slope stability grade at discrete locations was determined along the above-mentioned road section. The Geological Strength Index (GSI) is a widely used rock mass classification system that is estimated by visual inspection in the field. As it does not consider the orientation of the joint, it indicates the strength of the rock mass . It is a unique rock mass classification system that relates several rock mass strength and deformation parameters to a generalized Hoek and Brown failure criterion. The GSI is estimated by blockiness and the prevailing joint surface conditions at the site. It is recommended to assign a range of GSI values instead of a single GSI value to a particular rock mass. However, as GSI values are directly used in various failure criteria and numerical modeling techniques, a single value is assigned for a particular site. To overcome this, Sonmez and Ulusay [63, 64] proposed two indices: the surface condition rating (SCR) and structure rating (SR). The former is related to roughness, weathering and infilling of joints, and the latter is calculated by the volumetric joint count. These indices enable users to quantitatively assess the GSI at a particular site. 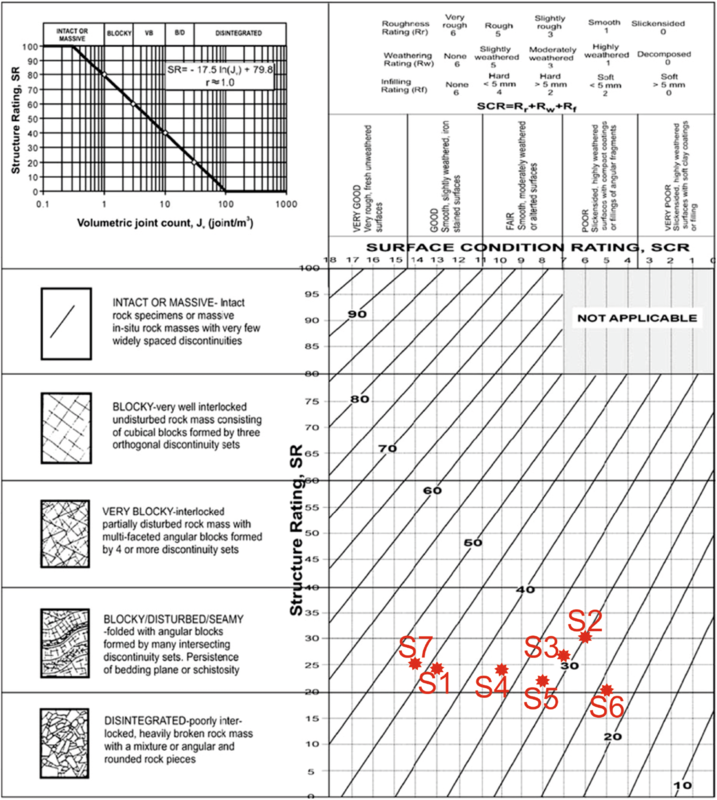 where Jv = volumetric joint count; Rr = roughness rating; Rw = weathering rating; Rf = infilling rating. Kinematic analysis is widely used to evaluate the potential for various structurally controlled failures (planar, wedge and toppling) due to the presence of unfavourably oriented discontinuities within the rock mass [3, 57]. Planar failure is likely to occur when a discontinuity dips in the same direction (within 20°) as the slope, provided that dip amount of the joint is smaller than the inclination of the slope angle, and it should be greater than the friction angle . Wedge failure is likely to occur when the line formed by the intersection of two discontinuities, forming the wedge-shaped block, plunges in the same direction as the slope face, and the amount of plunge should be less than the slope angle but greater than the friction angle . Toppling failure may result when discontinuities dip in the opposite direction from that of the slope by a very steep angle, i.e. ≥ 75° . Seven potential slopes were identified during a field survey along NH-58 from Kaliyasaur to Rudraprayag in Uttarakhand, India. Field data pertinent to slope stability were carefully collected by considering the geological and geotechnical complexities of the precarious Himalayan terrain. The rock mass encountered in the patch was very fragile with multiple sets of persistent discontinuities. Most of the investigated slopes comprise three sets of discontinuities along with some randomly oriented sets forming blocks of different sizes. The prevailing site conditions depicting various structurally controlled failures are illustrated in Fig. 2. The rock mass characterization was made by assessing the various RMR parameters. Accordingly, ratings were assigned to each parameter. Representative intact rock samples were collected from all sites and three NX-sized (54.7 mm in diameter) core samples were prepared from each site to determine the compressive strength (Table 1). The test was conducted according to the standards of the International Society of Rock Mechanics . Irrespective of orientation, the presence of joints or fracture frequency largely influences the quality of the rock mass. The rock quality designation (RQD) introduced by Deere  is a widely used index for assessing rock quality on the basis of fracture frequency. The RQD is calculated using the following formula. However, when the core is not available, the RQD can be calculated using the following equation . where Jv represents the total number of joints per cubic metre or volumetric joint count. As cores are not available, the RQD at all sites was calculated by the volumetric joint count (Table 1). Perpendicular distances between two discontinuities were measured during the field survey and the mean discontinuity spacing at each site was determined. Accordingly, all cut slopes were rated. Discontinuity conditions such as persistence, aperture, roughness, infilling and weathering were determined in the field. Groundwater conditions play a crucial role in the stability of slopes. The presence of water within the joints creates pore pressure and reduces the shear strength of the rock mass. If water is present in clay-filled joints, it acts as a lubricant for structurally controlled failures. Prevailing groundwater conditions were determined during a field survey to rate the groundwater condition parameter. The algebraic sum of the ratings of the above five parameters indicates the basic quality of the rock mass (Table 2). Qualitative estimation of the orientation factor sometimes gives ambiguous results with subjective interpretation of the stability class. Since the orientation factor is an important parameter, much exhaustive and quantitative evaluation is done using the CSMR approach (Table 3). 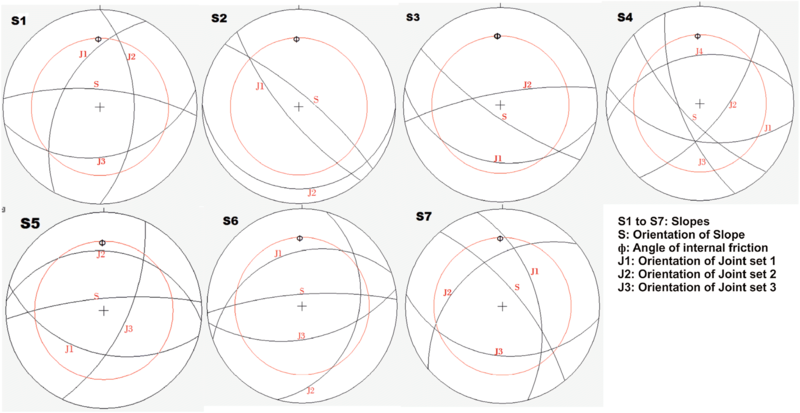 The orientation of slope facets and major discontinuity sets at each location were recorded and great circles plotted on a stereonet (Fig. 3) to analyse the angular relationship between the slope face and prevailing sets of discontinuities. Such geometric evaluation of the relative orientation enables identifying the varying potential of structurally controlled failures. Orientation of the slope face and prevailing discontinuities was analysed using a Schmidt-type stereonet and the most pronounced mode of failure along with the causative joint set at discrete locations is illustrated in Table 4. Various structurally controlled failures were determined by critical examination and establishing angular relationships between the slope face and prevailing joints. For instance, slope S2 is prone to the toppling mode of failure because of steeply dipping joints. The slope face is inclined by 85° in the N040° direction and critical joint (J1) forming toppling failure is steeply inclined (78°) in the N230° direction. The steep angle and the angle between the dip direction (195°) favour toppling failure. The planar mode of failure is the most prominent in the studied region. Planar failure is likely to occur at slope S3 because of the daylight conditions caused by joint set J1. The dip direction of the slope face and critical joint J1 is nearly parallel to the inclination direction of the slope face and the dip amount of the jointed surface is 40°, i.e. sufficiently less than the slope inclination and greater than the friction angle of the joint. These conditions together cause a planar mode of failure at slope S3. Unlike toppling and planar failure, wedge failure is formed by a critical combination or intersection of two sets of joints. The probability of the wedge mode of failure is controlled by the orientation of the line formed by the intersection. As witnessed in slope S5, the great circles of joint set J2 and J3 intersected in such a way that the point formed by their intersection fell in the critical zone between the great circle of slope and friction. This indicates that the line formed by their intesection plunges in the direction of the slope face with less plunge, thereby forming the critical conditions of wedge failure. The classification of the rock mass via the GSI system is an important component of rock slope engineering practices. It is a simple, fast and reliable classification system primarily based on the visual inspection of certain geological parameters. The structural conditions in terms of blockiness of the rock mass and joint conditions, which are related to roughness, weathering and infilling within the joints, are the key characterizing parameters in the GSI system. The volumetric joint count and joints conditions were determined in the field (Table 5). The outcomes obtained by different proxies (RMRbasic, GSI, kinematic analysis and CSMR) are illustrated in Table 5. Quantified GSI values are illustrated in the chart (Fig. 4). The quantified GSI values can be used for detailed appraisal by a sophisticated numerical simulation tool. 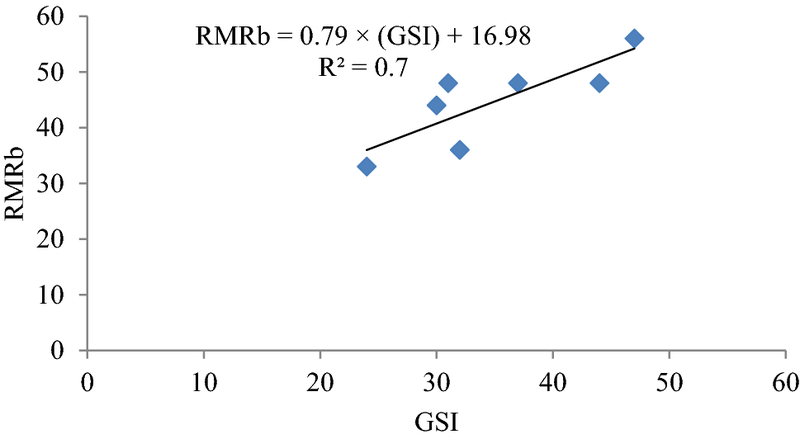 Furthermore, the GSI values and RMRb of the investigated cut slopes were compared, showing a linear correlation (Fig. 5). The outcomes obtained by different proxies have been summarized in Table 6. Rock mass classification of road cut slopes is an integral part of rock slope engineering practices. During the preliminary stages, such methods provide quick and cost-effective assessment of the stability grade of the rock mass. RMR, CSMR and GSI classification methods provide reasonable insight into existing stability grades of road cut slopes in the highly precarious Himalayan terrain. According to CSMR, most of the investigated slopes fall under the completely unstable to unstable stability grades. Stability evaluation by the CSMR method surmounts the uncertainty arising from marginal values at the class interval. Completely unstable slopes ought to be given appropriate and immediate treatment. Depending on the size of the potential falling blocks, nets must be installed on the sections at risk. Different rock mass reinforcement techniques such as rock bolting, grouting and shotcrete should be employed for safer designs along the highway. Kinematic analysis of slopes revealed that many sections along the highway are vulnerable to planar and wedge failures. However, toppling failure may occur at location S2. Moreover, quantified GSI values are also similar to the basic quality of rock mass obtained by the RMR method. The linear correlation between RMRbasic and GSI values can be used for further indirect estimation elsewhere. The present work provided a comprehensive understanding of the prevailing stability grades of road cut slopes along NH-58 from Kaliyasaur to Rudraprayag. For swift and hassle-free socio-economic escalation of the region, such studies should be performed in other vulnerable sections of the Himalayas. The authors thank the Chairperson, Department of Geology, Aligarh Muslim University, Aligarh, for providing the necessary laboratory facilities during the research. we express their sincere gratitude to Prof. M.E.A. Mondal for frequent discussions and suggestions during the study.